Three railway stations for Brecon ! 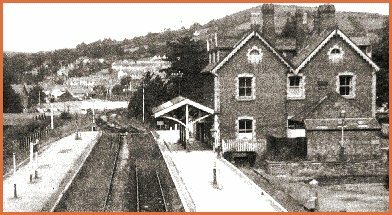 In 1867 Brecon was served by three different railway companies, with their trains coming in to three separate stations - the Watton, Mount Street, and Free Street stations. The new Brecon station (above) is shown on this 1887 map (left) as the 'Joint Station'. There is a large 1890s picture of a steam train at the station in our picture section. Three stations in one town was not very practical, so Free Street was chosen as the site for a new station to be used by all train services. This opened in 1871 and included offices for all the railway companies in one large building, shown right. The photograph above was taken after the closure of the railway in the early 1960s, but it shows the large scale of the station buildings, which once served three companies. The coming of the railways to the area in the 1860s brought many advantages to local people, including lower prices of essential goods. But it also put an end to the commercial use of the canal and to the ancient trade of the animal drovers, who herded livestock for hundreds of miles cross-country to markets in England.